"Optimisation of breast cancer detection using digital X-ray technology2"
Q1. What is the impact of using different X-ray qualities on cancer detection in 2D imaging? Q2. What is the best use of dose when screening with combined DBT and 2D mammography? Q3. 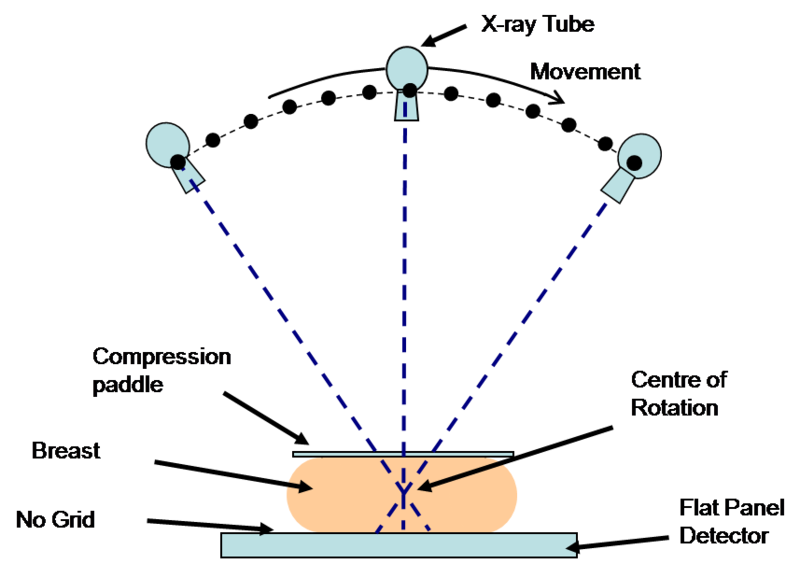 What is the effect of dose on detail detection in 2D and DBT? Q4. To what extent does tube motion degrade calcification detection? i.e. how much is gained by using either reduced motion or step-and-shoot compared to continuous tube motion in DBT? Q5. What are the advantages and disadvantages of using different angular ranges in DBT? Q6. Is synthetic imaging (derived from DBT) an acceptable alternative to 2D imaging? Q7. What is the technical and clinical performance of different commercial designs of 2D and DBT? Q8. How do different reconstruction algorithms affect cancer detection? Q9. What are the X-ray attenuation coefficients of different types of normal and abnormal breast tissues and how do they affect the results of breast modelling? Q10. Can quantitative analysis of the initial appearance of DCIS and sequential change be related to the presence and the subsequent development of invasive disease? Over the next five years key decisions will have to be made on how and whether to introduce new imaging technology into screening and assessment. OPTIMAM2 will be an essential step in this process. The nationwide adoption of such enhanced imaging is expected to lead to a reduction in the number of unnecessary recalls, earlier breast cancer detection and improved survival. Currently there is a lack of evidence on which to base strategic decisions on screening technology which this project will address. Currently there are about 100,000 recalls per year in England of which only about 16,000 result in cancer detection. If we are able to correlate our characterisation of serial DCIS images with pathology and disease progression this would help to reduce overdiagnosis and enable improved management of this disease. Three of the investigators (Young, Given-Wilson, Wallis) are members of most of the committees that steer policy decisions on the delivery of breast screening in the UK. So a pathway to clinical application is established. Professors Young and Bosmans are co-authors of the current European guidance on equipment performance in breast imaging and the results of this project will be used in the next revision.